study samples inside of the binary package, read samples\ReadMe.md play along. Try samples\helloWorldFromCLR there is ReadMe.md inside. Try samples\helloWorldFromJVM there is ReadMe.md inside. Using reflection we grab public method signatures for core classes of .NET and Java and generated proxy classes for the other side. We have .NET version of JNI API. Intraprocess - it means that both VMs are in same process. Any call uses same thread and same stack for both environments. It's relatively fast. Proxies - we use proxies which look like and behave like the real/original object. Marshaled by reference except for primitive types and arrays. Garbage collected - if you don't create cycle between VMs heaps, the proxies and instances are collected and released properly. Proxygen - tool to wrap your own library. Works with reflection, so you need just .jar or .dll, and proxygen config file. You could wrap most CLR or JVM classes. 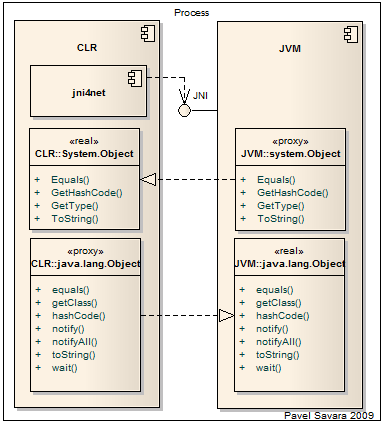 Core - core classes of JDK and .NET framework are already included in jni4net. Using that for reflection and invocation across the boundary is possible. Platforms - at the moment only Windows 32 and 64 bits. CLR 2.0 and CLR 4.0. JRE 1.5 and above.